Pamommy Loves to Run: MASH up Review and Giveaway!!! MASH up Review and Giveaway!!! 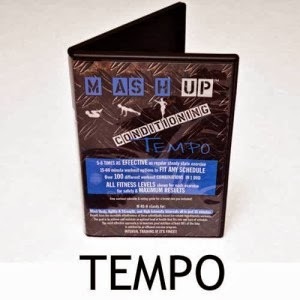 Recently I was given the opportunity to review a MASH UP Conditioning Tempo DVD through my Girls Gone Sporty Ambassadorship. I am always on the look out for new DVD's to do on my "rest" days and this one is a keeper. I'm also trying to get ready for the beach and this is helping me get there. I love being able to choose 1-3 different workouts everyday that get my metabolism revved. 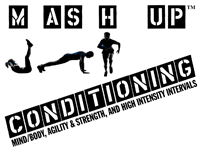 The program stands for: M- Mind/Body, AS- Agility and Strength, H- High Intensity Interval all in one. The DVD includes 7 different tempo workouts and can be combined with each one with 5 minutes Mind Body exercises, 5 minutes Agility and Strength exercises and 5 minutes HIIT. Each tempo segment is 15 minutes and can be combined with any other one to customize your workout to be from 15 to 60 minutes depending on your needs. There are also three levels within each tempo segment to allow for all levels of fitness to participate. Now what I think: I've done a 6 of the tempo workouts, I prefer to do 30 minutes of training on my rest/non running days to keep me sane, cross train and give my arms and core a little push on those days. I love the timer, the visual always helps, especially when I am doing exercises that I am not too fond of due to their difficulty to me. The instructor is great, she explain all moves, all levels and why we are doing what we are doing. The DVD is easy to navigate and easy to shift between the different segments. I would definitely recommend this one. I love the options, the exercises and the way I sweat after 30 minutes of work. Thanks for the opportunity GGS and MASH Up. Now for the fun stuff, the ladies over at MASH UP have given me a DVD to giveaway to one of my lucky readers Follow the rafflecopter!! Running and starting weight training.